I am moving in slow motion, avoiding direct eye contact so I don’t get walloped by the powerful wings of the trumpeter swan I’m trying to feed. He stands regally on his huge flat, black feet, hissing a constant warning at me that sounds almost like motor noise. I eyeball the size of the dirty water bucket and food dish I need to remove from the cage and try to gauge how far I can crack the door open without bumping into the swan: It might just fit. The warning hiss has increased in volume. The door opens towards the swan, shielding my body – as long as the bird doesn’t move towards the open crack. I turn my head and body slightly away, trying to be non-threatening, and stretch my arm towards the water bucket and into range of the swan. Volunteering at Northern Lights Wildlife Shelter is a never ending string of surprises and adventures big and small. Injured or weakened birds that are dropped off by concerned people make for an interesting change from looking after bears – and I’m a sucker for the swan because I love waterfowl, although his stay with us will be brief. NLWS specializes in mammals, not birds. We send all birds with more complicated injuries or difficult diagnosis to the better equipped and more knowledgeable OrphanedWildlife Rehabilitation Society (O.W.L.) in Delta, B.C., or the Wildlife RescueAssociation (WRA) in Burnaby. I feel like I’m doing Tai Chi or inventing a new yoga pose as I slowly bend down and close my fingers around the rim of the water bucket, clinging to the wire mesh of the cage with the other hand. Success! I pull the bucket out of swan range, accompanied by the steady hiss and grumble of the bird. After performing the slow motion water-bucket pose again, this time with the clean, full bucket, I slide fresh food in and discover that this swan is the messiest of eaters. He stabs at the bowl with his beak, long neck undulating like a snake. Grated apple, potato and chick feed mix go flying everywhere as he scoops it up; he eats like a weed whacker. It’s unclear what is actually wrong with him, certainly not his appetite. Somebody found him in their yard and, when the bird didn’t leave, caught him and brought him to NLWS. 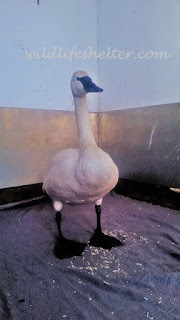 Coast Mountain Air is lending the swan a helping wing as they do with so many birds in need of care by transporting him for a very reasonable rate to Vancouver. Catching the swan for his plane ride down south is less Tai Chi, and more action. Veteran NLWS volunteer Kim slowly approaches the bird with an open blanket and then pounces, covering the wings and long neck. While she hugs the swan (who does not appreciate it), I scoot the dog crate that he will travel in into position. The swan succeeds in freeing his head from the blanket for a few seconds. I pull it back over his eyes and carefully guide his head into the crate while Kim manoeuvres the rest of his body. Finally we secure the bird in the crate. The swan leaves behind an incredible mess of shredded food and poop. We get an update from the shelter in Burnaby after he has been examined: He has no injuries, is only weakened – and he is the messiest eater they have ever seen. After a few days of building up his strength, the swan is released again. I’m happy I got to spend a little bit of time with him. I am! I wonder what animal babies spring and summer will bring.